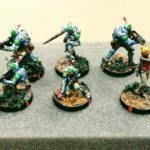 40k Skirmish Variant: Recon Squad! I’m pumped to announce the official release of Recon Squad, our unofficial skirmish variant for Games Workshop’s Warhammer 40,000! Colin, myself, and a bunch of PAGE people have been working on this for almost exactly a year now. We’ve used it through two decently sized events (December and January) as well as several playtest sessions since the last set of big revisions, so I think it’s solid. Thanks to everyone that’s contributed, Luke Walker for the great cover art, and everybody else that’s given it a shot in events so far. We’ll be putting up more Recon Squad related material shortly, namely a great narrative campaign and mission pack. If you’d like to be notified when those are up, join our 40k announcements list! Veterans will recognize Recon Squad as very similar to traditional Kill Team games. For those unfamiliar with that style of skirmish games in 40k, it’s a variant for very small, fast, tactical battles of individual troops. In this case armies consist of at most 200 points and are very restricted in the roles and stats available. Once on the field, each model acts individually, running about on its own to fight the enemy and capture objectives. I personally wouldn’t want to play this way all the time, but it makes a nice change of pace and can pack a ton of strategic depth. More people should give it a chance as it’s a really neat way to play 40k. It can also be a good way to introduce new players to the basic game mechanics and models. Just as it’s cool to occasionally throw down all the models you own on the table at once, it’s also really rewarding to occasionally focus on just a handful of models. Traditionally that’s been the domain of Games Workshop’s official Kill Team variant of 40k. Earlier versions were kind of weird, but the versions released throughout 5th edition 40k worked well, and were tight, free 3-page PDFs. The latest, for-sale eBook though is disappointing: Overpriced, terrible formatting, sloppy rules, and poor adaptation to 6e/7e despite being released at the end of 6th/just before 7th. It’s not terrible, but it’s not great. 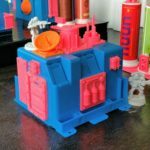 I have a review of some of the problems here. Sentinels were *made* for this format. Recon Squad is our response. We think it’s a tighter ruleset, better adapts 7th edition to skirmish play, and has more balance. As just a few examples, it explicitly addresses Brotherhood of Psykers/Sorcerors, makes Astra Militarum orders useful, and limits grenades and hordes. None of that is addressed in the current Kill Team. Obviously our Recon Squad variant is heavily inspired by the traditional Kill Team rules, but it is its own animal and a lot of thought has been put into tuning it for modern 40k and casual to competitive play. A lot of emphasis has also been put on access. Obviously as a free PDF anybody can check it out. One of the problems with Kill Team as a $12 eBook is that it’s difficult to use it in a tournament or campaign—nobody wants to be forced to buy another book just to enter. Recon Squad doesn’t have that problem. As importantly, it’s also easy to jump in and play. Unlike some other unofficial 40k skirmish efforts, e.g., The Heralds of Ruin’s excellent ruleset, it uses the same list building as always. The core mechanics also aren’t changed other than breaking units apart into individual models. 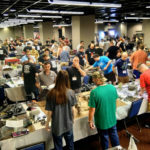 So veterans can easily throw down a quick skirmish, and newcomers can play Recon Squad with their handful of models and apply what they learn directly to standard 40k. A few of the design considerations in Recon Squad are worth touching on. On a simple note, our “Everyone Falls The First Time” rule adds in a basic ability to jump over short gaps. It also restores the ability for models to jump down from large heights in return for possible injury, which was removed in 6th or 7th edition. These rules aren’t strictly required, but are very useful to help models move around on the super dense boards many people will want to play on in this skirmish setting. 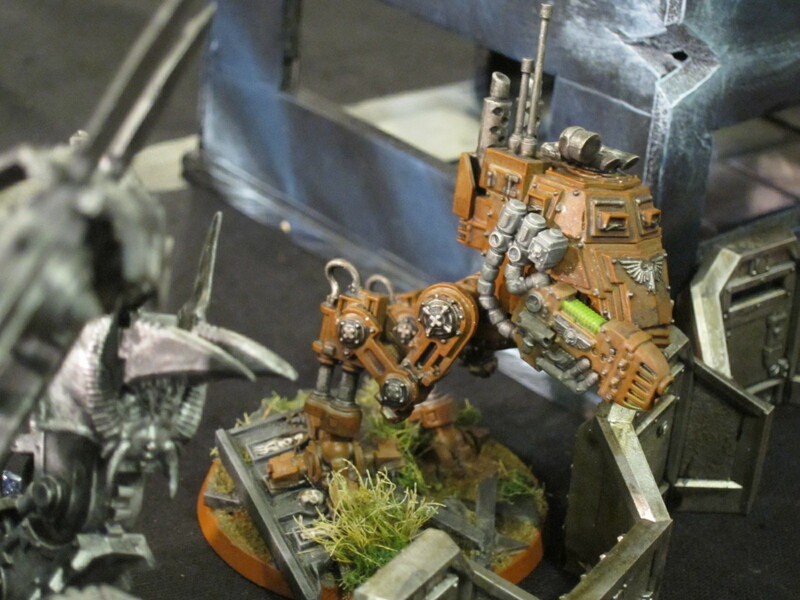 Boards generally still shouldn’t be completely jammed with terrain as shooting will become very ineffective, but there should be more terrain than usual and it can be a lot of narrative as well as gameplay fun to construct very detailed, rich environments that wouldn’t work in standard 40k. 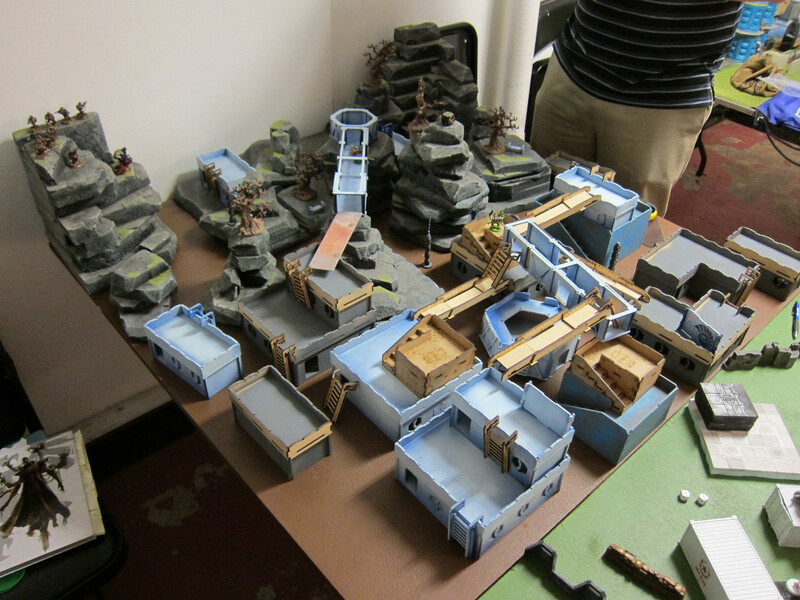 A very elaborate example of a Recon Squad board. More importantly, the “Frag Bag” rule limits how often a model can throw grenades. In standard 40k the relatively recently added rules for using grenades in shooting attacks aren’t a huge deal: You’re not frequently in range, and only one model per unit can do it at a time, so the effects are muted. In skirmish though each model is their own unit, and they’re frequently in range. Marines in particular become supercharged because they’re all running around with a free S8 AP3 assault gun due to their krak grenades. Recon Squad explicitly curtails that. Similarly, Brotherhood of Psykers/Sorcerors needs to be explicitly addressed as the army unit is broken up into a bunch of 1-model units running around. We’ve gone with allowing one model in such a unit to act as a psyker each turn. The main basis for this is that making each model an independent psyker would be an overpowering buff. At the same time, discounting it would render many units completely powerless, as Kill Team does. Our “Cast A Spell On You” rule tries to strike a balance between the two. Horrors and orks goin’ at it. We’ve also broken with traditional Kill Team rules a bit in the force organization and army restrictions allowed. An HQ slot is given, and the limits on wounds and armor are both bumped up. This permits a number of non-traditional units, but squads are still kept within reason and a number of fluffy builds are enabled. 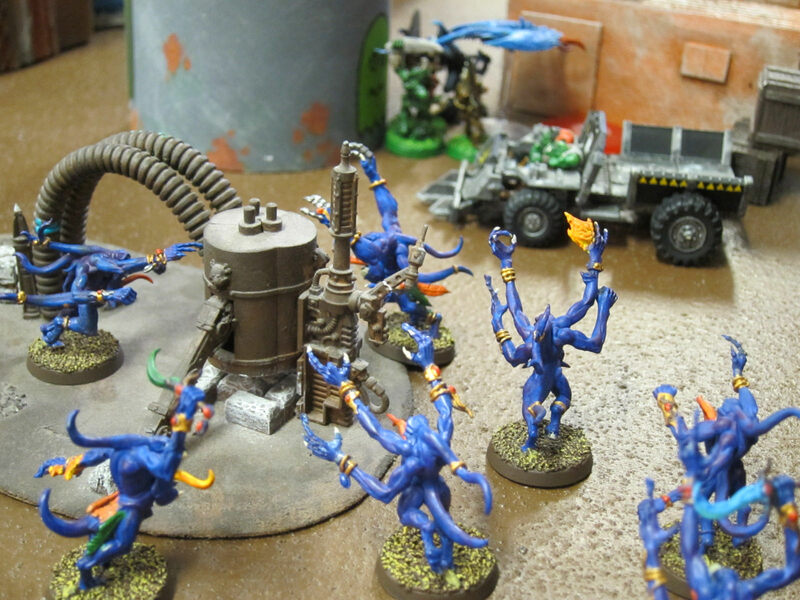 For example, a common Tyranid complaint with Kill Team is that it doesn’t permit Lictors because they have 3 wounds, though they are otherwise an extremely appropriate selection by both narrative and gameplay. Space Marine Captains and Terminators are also both permitted in Recon Squad. Running a squad of 5 bare Terminators to hunt down xenos is super fluffy and probably isn’t actually overpowering despite the traditional ban—it’s probably actually not even a great squad. They’ll be real tough to kill for most troops, but special weapons combined with specialist traits will make short work of them and with so few models the squad will have significant trouble holding objectives, or even getting to them before being mobbed. Similarly, 100+ points on a Captain that could easily die to an ignores cover-meltagun or relentless-lascannon is probably a poor investment but could certainly interest someone. Which brings us to the rule we were most conflicted about: Squads are capped at 20 models. This does eliminate some fairly narrative builds, like a basic Astra Militarum Platoon. The rationale though is simple math. Above twenty models and most factions will really struggle to do enough damage each turn to have any chance of breaking the squad or not being simply physically blocked off every objective. Even at twenty models the opponent has to eliminate a considerable number each turn to whittle it down significantly. While it’s unfortunate to force the Imperial Guard, Orks, and some others to focus less on their most basic troops, it’s not out of narrative character for Recon Squads to be composed of more elite troops. This restriction also goes quite a ways to addressing one of the main balance problems in Kill Team play, and isn’t something addressed at all in the traditional or current official rules. All in all we think Recon Squad is a pretty solid ruleset, and have been happy with how it’s worked out in our events so far. There’s little new to learn to play except the tactics, and those tactics are pretty deep. 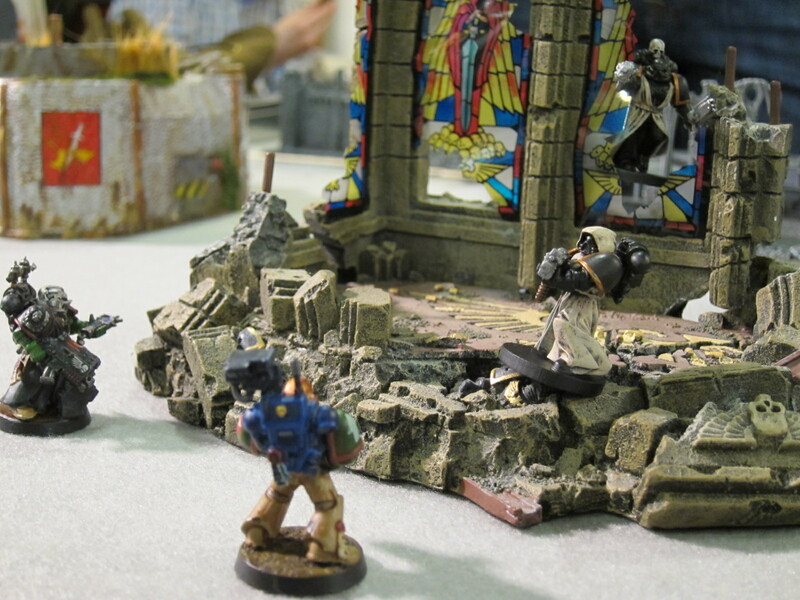 In our campaign last Saturday Colin and I had a super tight match between his Fallen and my Kingbreakers that was among the most chess-like 40k I’ve played in some time as Sergeant Harmon and his Ghosts (Sternguard) ran the traitors down among the ruins of an Imperial shrine. So grab your favorite plasmagunner, make him an Ignores Cover specialist, and get him out there to fight for the Emperor! 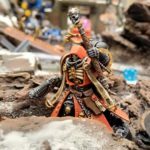 This entry was posted in design, miniatures and tagged 40k, design, featured, featured release, recon squad, rules, small games. Bookmark the permalink.